In last week’s newsletter I shared a yummy recipe from a new online friend – Charlotte Siems. We’ve been emailing back and forth for the past few weeks, getting to know each other better and started chatting about our families and parenting. 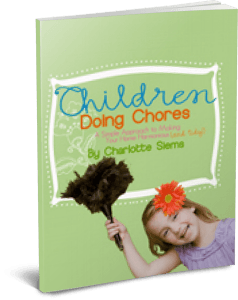 It turns out that Charlotte, a mom of 12 (yes, you read that right), is quite the expert when it comes to getting your kids to do chores. I asked her to do a little text interview on the topic and she was kind enough to go into quite a bit of detail. I hope you enjoy reading it as much as I’ve enjoyed interviewing Charlotte. Charlotte, will you tell us a little bit about yourself and why you are so highly qualified to talk about getting kids to do chores. I have twelve children–ages 7 to 30, six sons and six daughters–and we’ve homeschooled for 26 years. Of course I started out with one little kindergartner and from there we “just growed.” When we first started homeschooling it didn’t take me long to realize that I needed help with the house. At the time my oldest was five so I needed ways to teach her to help, while keeping track of what was already done–without asking each child ten questions. I still have five kids at home (actually six for the summer, as one son is home from college), so we’re still doing the chore thing every day. Our little grandchildren come over often, so I am still dealing with toddler and baby messes, too! Why is it so important for kids to do chores regularly and what are the benefits besides having some help around the house? My grown children have actually come back and thanked me for having them do chores, because they were amazed to find that their college classmates didn’t have basic life skills like doing laundry. I think that chores teach children just as much as academic subjects! Busy moms need all the help they can get because it frees them up for the things only they can do. Believe me, moms are not doing their children any favors by doing everything for them. Our children will be adults most of their lives, and it’s an easier transition if they know how to clean the kitchen and scrub the toilet. What do you think about getting started on getting into a chores routine during the summer months when the kids are home from school? That is an awesome idea because the whole family will develop a new chore routine before the busy school year begins, rather then trying to adjust to chores AND a new school schedule at the same time. While raising 12 children I’m sure you’ve come across just about any challenge we can imagine when it comes to children and getting them to do their chores. Can you share one challenge along with a quick idea of what you did to overcome it? At one point we switched the chore schedule daily until we noticed that everybody was slacking because, hey, they weren’t going to have that chore tomorrow. We changed to a schedule of keeping the same chores for two weeks and that gave immediate relief! We also added extra days on a particular chore for every day that it was done poorly. I have to admit, I’ve been pretty slack when it comes to making up chores and sticking to them. Any tips for helping us get started? I write about home, family, faith and fitness at www.charlottesiems.com. However, she doesn’t just share why you should teach your children to do chores she gives you hope that not only are you getting your house neat & tidy, you’re also teaching your kids responsibility, important life skills and the value of doing a good job as well as facing consequences of not giving your best efforts.